Top off your Elfa Drawer Frame with a handsome, scratch-resistant Melamine Top. Available only at The Container Store, it works great as a dresser top. The double-stick adhesive (included) insures it will stay securely on top of the frame. When Elfa Drawer Frames are placed side-by-side, these flush-mount tops allow the frames to be secured together with our Elfa White Frame Clips. White Melamine Tops is rated 4.5 out of 5 by 60. Rated 5 out of 5 by EIsForElfa from Elfa Purchaser Since the 1980s I've relocated three times since my first Elfa purchase(s) to organize my sewing and craft supplies. The ability to re-configure the various components, as my skills, interests, and life styles evolved, is a definite plus. Numerous Elfa draws and bins keep my tools and supplies warehoused in two (2) 4-5 foot tall carts. Drawer contents are organized by the type of projects they will be used for. Be it quilting, candle making, clay sculpting, haute couture, jewelry making, scrapbooking, and so on. Then I have a desktop-height cart specifically reserved for an active project(s). When I want to make jewelry, I transfer the entire drawer/bin, and its contents, from the warehouse to the active project cart. The gift wrap cart is always stocked and at the ready. When it's time to fire up my kiln, which I must do it outside, because the fumes are deleterious to my pet parrot. Fortunately an Elfa cart can survive outside in a sheltered environment overnight. However I do cap it off with a top made of non-flammable material. As a recent retiree and new homeowner, of a 120-year old house, I’m now upgrading and re-configuring my Elfa components to organize my clothing, hardware, and gardening supplies. Elfa grids, once mounted to the walls, are now either hanging on the back of a door or have been strung together to form a screen/room divider. By the way, individual Elfa drawers and bins can be packed and shrink-wrapped for easy transport from one address to another. I also keep a spare drawer or two in the car to keep stuff from rolling around in the trunk. Rated 5 out of 5 by LuvErn29 from elfa makes great desk setup components I recently added a top to a rolling file cart I already had, making it into the end piece of my desk setup. I love the versatility of these components. I have many elfa components which I have changed about as I have lived in different homes. The picture shoes my office area. This set-up has turned out the very best! Rated 5 out of 5 by MargieL from The Top Completes The Look The top looks great on my set of mesh drawers! I placed it in my closest creating more space in my room. It's a great product. Rated 5 out of 5 by jansy1 from Absolutely the Best! 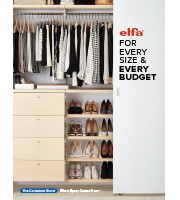 I have now purchased 3 Elfa storage units for my closet, two wider and this narrower one. I have a bedroom with very little wall space for dressers, so these act as dressers within my closet. Easy to put together and so functional. This smaller one houses make-up, and bathroom extras as it is narrower. I highly recommend. Rated 5 out of 5 by Sadie1 from Use in any room I use these tops on all my elfa drawer units. They are great in the garage, utility room, closets, or anywhere you need vertical storage solutions. They are a melamine that can be cleaned and wiped down. The easiest installation ever, no screws or bolts and so useful. Rated 4 out of 5 by MinimizeIt from Tops slightly too small I love Elfa - and was excited to solve an organinzing dilemma for my mom with four sets of elfa drawer frames side-by-side, each topped with a white melamine top. The tops fit fine if you have one unit - but if you put them side by side and attach the tops so as to not have a space between the units - they don't line-up. I've attached a photo so you can see how far off they are by the third unit. Overall the units look great, and the melamine tops are very sturdy and attach well with the strips - we solved our problem by putting the corner safety pad on the end, so the 'short' top was not noticeable. Rated 5 out of 5 by sewnsew from Sturdy and fits well This top fits the basket unit perfectly. It is attached with an adhesive tape. I'm not sure how effective the hold will be. It does make the unit more useable by giving a solid top on which other items can be stored. I use them in my sewing studio for storing my serger when it's not in use. Rated 1 out of 5 by Tjf46 from HATE the new style top! I would give everything else a 5 star rating. But these tops I wouldn't even give 1 star if that were possible. I have some Elfa units that I have had for several years and love them. I just bought 3 more to add to the ones I have and the tops no longer fit down over the frame. Now you have to use tape to adhere them to the frame. WHY did you change them? The old tops could be lifted off at any time but were secure when on the frame. I have a large walk in pantry ready to finish and had planned to outfit it with the elfa units. Not now. Will find another option. Rated 5 out of 5 by Jynx from awesome pull out drawers bought this to store toys in and wish I could go buy 10 more of these!! Very sturdy and serves its job. Rated 5 out of 5 by Hartsgirl from Elfa cool storage! I was in need for some quick easy storage and this fit the bill. This product went together easily and has ample storage and fits into my small walk-in closet. Great product, a little pricey! Rated 5 out of 5 by LauraWS from Elfa I absolutely love the elfa systems and the staff at The Container Store is awesome. Rated 5 out of 5 by courtneyh479 from These shelves are amazing!! Great for storage and organization. Would recommend this to anyone looking for easy storage. Rated 4 out of 5 by megs0809 from Great! Easy to put together, fits perfectly in the space, and seems durable. Rated 4 out of 5 by Marthamb from Useful finishing touch We've had Elfa for years and love it. When I got some new drawer sets, I bought the melamine tops and I love them. They finish the drawers so contents in the top drawer are hidden away and the add additional room for extra storage, they are durable once you put them on the unit but be careful not to drop them before that - they are more fragile than they look and edges and corners can be vulnerable to chipping or bending, showing the pressed board underneath. Rated 5 out of 5 by artistatwork from Perfect Solution I love my elfa cart but I needed to change the way I was using it. I had mine set up for files so to change it I purchased 2 drawers and the melamine top. The top gave me the extra tabletop space I needed. And, by adding 2 more drawers I was able to adapt the cart to fit my current needs. Not only is it perfect, it is really nice looking. I highly recommend it. Rated 5 out of 5 by benz2us from Great Product Great product, I would recommend this to everyone. Great for storage and convenience. Rated 4 out of 5 by facets58 from wrapping paper organizer The melamine top was the perfect finishing touch to my wrapping paper organizer. I had no plans of buying a table top and was going to leave the drawer open but once I put the casters on, the drawers became a great quick card writing table that could roll anywere for wrapping writing or stacking gifts for prep. Rated 5 out of 5 by Mimi3 from Reliable Elfa I need to repurpose a drawer unit and needed a top for its new use. The drawer unit has been used for years and it's great to still be able to add to it. I have used Elfa products for a pantry and for an office space. It has served me well and the quality assures me I will be using it for many more years. Rated 4 out of 5 by avasgranny from White Melamine Top Still deciding if I will use the white top or the butcher block. The white top will be great in the laundry room - or butcher block if I keep this in the kitchen. . But either way I would recommend. Love Elfa products. Good quality. Easy to assemble. Rated 5 out of 5 by Techlore from Elfa drawer frames and tops I purchased 2 sets of the white 8 drawer frames and the white tops to go with them and they are excellent! I love the tight mesh of the drawers because it's a lot more versatile than the wire drawers I've purchased at other stores. I also got the tags so I can label the drawers and it works great. The only issue I have is that you have to be very careful placing the top on the double sided tape. It's almost impossible to reposition if you miss and don't get it set straight the first time. Rated 5 out of 5 by Rock from Elfa Shelving is a Life Saver I replaced my pantry closet shelving, that drove me insane, with a new Elfa unit. What a life saver! It was easy to assemble, the drawers glide easily in and out, and it is easy to store the pantry items I need. I highly recommend this purchase. Rated 5 out of 5 by MartiS from Elfa Drawer Frames I first bought these units as part of a closet makeover, then I moved and bought more to continue using as regular dressers. I'm downsizing and simplifying with functional and practical furnishings. I don't need or want fancy, expensive furniture and the Elfa Drawer Frames are durable, configurable, and space-saving. I use them as dressers and as a nightstand. Rated 2 out of 5 by Convenience from All those pieces It drives me crazy to buy something like this and have to put the frame together. Really, at these prices, why can't it come put together. The unit is still sitting in my closet waiting for assembly. Would love to be using it soon!. Maybe I can recommend after I get it assembled. Looked great in the store. Rated 5 out of 5 by Jenufa from Elfa components As with all Elfa products, I am delighted to be able order components for my Elfa pieces, some of which were purchased almost 30 years and three moves ago. Ordering is simple, service is prompt, and above all, the products are USEFUL. Rated 5 out of 5 by Murph1887 from Great way to top your Elfa units The white melamine tops were the perfect way to finish off the drawer units I bought for my office space. I like the clean look of the white and you don't get more durable than melamine. Rated 5 out of 5 by Lind from Easy to use and durable. A little heavy, but should be fine. Rated 5 out of 5 by tundra from Good old Elfa, still around. Bought my first units 20 years ago, and recently came across another at a yard sale, but needed a new top , as old top was wrecked. I ordered one from the website, and a new top was quickly delivered for much less shipping than it would have cost to drive to the store, 70 miles away. Rated 5 out of 5 by BBNYY from Great Top I purchased an Elfa melamine top for my new cart. It certainly makes my cart more versatile. Thanks Elfa! Can I purchase replacement adhesive for the top? I needed new rails and would like to reuse the top I already have. Use of the top means you can't disassemble later? I have a 15-year old drawer unit that I want to send to college and add a top as a bedside table/storage unit. The reviews describe the adhesive bond as permanent, meaning at the end of the year, we are not going to be able to break down the frame again for transport? I understand your concern. The older tops had two (2) dato channels on the underside, that interlocked with the frame of the cart. Securing the top in place. Yet still allowing the cart to be dismantled. If the cart is to remain stationary once it's assembled, consider one of the following. * Substitute the permanent tape for a semi-permanent tape, that can be removed with a solvent like &quot;Goo Gone&quot;. * Substitute the melamine top for a reclaimed/repurposed surface; like a cutting board, tray, glass, mirror, tile(s). pavers, or similar surfaces. * Elfa once offered a drawer that baslcally amounted to a shelf, because it occupied a single runner. When placed in the uppermost runner it could serve as a top. Any flat, sturdy surface, that's thin enough to fit in the runner might work. I want to get the 45.5 drawers with a melamine top. What is the total height with the melamine top? I have to have something under 46 total inches. It looks like the top sits slightly under the top of the drawer frame but I want to be sure. I want to connect several drawer units. Is it possible to buy a larger white melamine top to cover all of them? I was tempted to do the same with two smaller ones but then purchased one larger one, but you are limited by the sizing of the Elfa products. I suppose you could make your own. can i use these in the laundry room where there will be wet clothes laid on top, soap, maybe spills, etc? will they warp? also are they textured or smooth? These tops are smooth, but they are not waterproof and the melamine coating could warp if wet for long periods of time. Can these tops sit on top of solid shelf brackets? I want to hang some 18&quot; hanging mesh drawers and top them off with 2 of these shelves. We do not recommend placing our White Melamine Tops on elfa Solid Shelf Brackets &ndash; there is no way to secure them. We would recommend our 20&rdquo; deep White Melamine Shelves for your solution.